Go on holiday at this 5-star campsite at the best price, thanks to the special offers of this 5-star Castel Campsite L’Anse du Brick in la Manche. Take advantage of many discounts for your stay at the campsite for a camping pitch or rental accommodation. The Castel Camping L’Anse du Brick offers various promotions for different interests: temporary offers, special offers, formulas, … View the different offers and choose the one that suits you best. Check our good deals and special offers of the month for your stay in France. Take a tour of la Manche, from Cherbourg to Mont-Saint-Michel, spending a part of your stay at Castel camping Lez Eaux! Booking your stay early provides benefits! Why stay at the Castel Camping L’Anse du Brick ? The Castel Camping L’Anse du Brick is a 5-star campsite located in l’Anse du Brick in the North of the Cotentin. The campsite is located in a nature reserve, between a natural forest and the Channel sea. Its pitches are partially terraced, giving a lot of unique charm and many campers can enjoy an exceptional view of the sea from their mobile home or from their tent during their stay in the Cotentin. You can reach the fine sandy beach via a convenient walkway that connects the shore to the campsite. At L’Anse du Brick you will benefit from a complete water park for your holiday: indoor heated swimming pool (plus paddling pool), heated outdoor pool, water slide (outside) with shelter basin, or you can bathe in the sea near the campsite. But the beach is not supervised. In the low season (spring and autumn) you can also surf on the beach. The campsite rents sea kayaks throughout the year to entertain you with friends and family. Many activities on the campsite itself are offered at the campsite. For example, you can take advantage of the sports fields for a game of football, pétanque, tennis match … A game room is at your disposal with pinball machines and table tennis tables. Your children can enjoy themselves on the bouncy castle. You can also rent mountain bikes at the campsite to make trips through the forest or on the roads in the area. In July and August: in the morning there is the Kids club with various activities for your children and the children can make new friends. In the afternoon the animation team of the campsite organizes sporting or fun activities, the ideal time for some fun and meet new people in a nice atmosphere and with a good mood. A concert or shows are organized free of charge every week. The campsite has 2 restaurants. The first is the Maison Rouge, a gourmet restaurant. Her specialty is fish and seafood. Her kitchen uses the regional products of Normandy and knows how to stimulate your taste buds. The other restaurant, pizzeria brasserie Le Brick welcomes you with a varied menu: salads, dishes from the menu and of course pizzas. During your stay in the Cotentin, you have the opportunity to visit Low Normandy, its beautiful villages and landscapes, to absorb its culture and to feel its history. 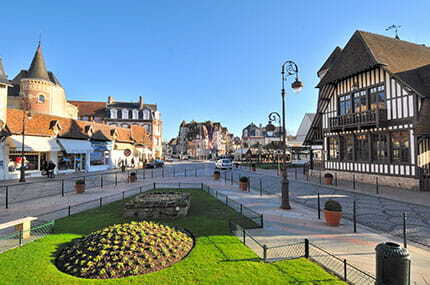 Normandy is a region with a rich history, a cultural heritage of great value. With the Vikings, the Celts, the Galians, the Romans, the history of William the Conqueror and the Second World War, there are numerous historical places to visit … Ideal for cultural trips in the family. 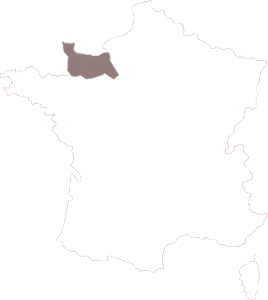 Normandy also has beautiful towns and villages to discover: Granville, Barfleur, Cherbourg, Deauville, Port-en-Bessin, … Beautiful beaches and special nature, we recommend you to follow the GR 223, a walking path that leads you through the beautiful nature of the Cotentin. From l’Anse du Brick you can visit many tourist sites: the landing beaches, Sainte-Mère-Eglise (village liberated during the Second World War by American parachutists), the world wonder Mont Saint Michel, Saint-Vaast-la-Hougue and its fishing village. You can taste various culinary specialties: escalopes normandes, tarte tatin, Caramel d’Isigny, Crème Fraîche d’Isigny, cider and calvados …. Book from today your stay in a mobile home or camping pitch! Take advantage of our offers to save on the price of your stay and catch your breath during your holidays in the Cotentin at the 5-star L’Anse du Brick campsite. View our offers at the top of the page and choose the promotion that best suits your choice for holidays between April and September at L’Anse du Brick. Find out about our camping pitches and holiday rentals in Normandy.